Green Painted metal cabinet with rows of shelves for holding set type, Bill Head size. Rows are marked across the top with left-to-right letters E F G H. Strip of wood inserted down LHS numbered from top 1 - 25. OGDEN early model cylindrical lawn mower. Small back roller, no catcher, rope start. Small gold painted petrol tank mounted between handles for gravity feed. Belt driven cylinder blades, aluminium engine cowl, rubber rimmed wheels, engine control on RHS handle. Galleys print type cabinet holding type which has been set to print. Each tray has letters of alphabet on right hand side. Green painted metal cabinet. In gold lettering on black ground on front of worktop: "PRESCO TYPE CABINET C24" In ink, front right side of work top: "11"
Green painted, hand operated, floor standing drum carder. Metal guard badly corroded. Four legs. Three meshing gearwheels. Large spikes on drum. Wooden roller to feed fleece. Ruben Sutcliffe / Maker / Manchester. In relief on topside of frame. Horizontal cylinder oil engine in working order. Mounted on a steel chassis with 4 cast iron wheels. Two flywheels and one flat belt pulley. Cylindrical cooling water tank and exhaust vertical exhaust pipe mounted at crankshaft end. Engine painted green with red wheels and red crankshaft balance weights. Oval brass plate on cylinder - "The Austral Oil Engine / Ronaldson Bros. / Makers / No. 1113 ? & Tippett / Ballarat Victoria" Thin oval metal transfer on cooling water tank with makers name and place of manufacture around Australian coat of arms. ELROD strip casting machine not in working order. 'MACHINE NO. F2713E ' etched on brass plate. Instruction plate on top surface. Cream enamel fridge with large chrome handle. Small, box-like freezer compartment inside. Serial number on plate "500-2185". On front of freezer box, "BEAUTY POWER STAMINA PRESIDENT" in a circle with image of an eagle in centre of lettering. 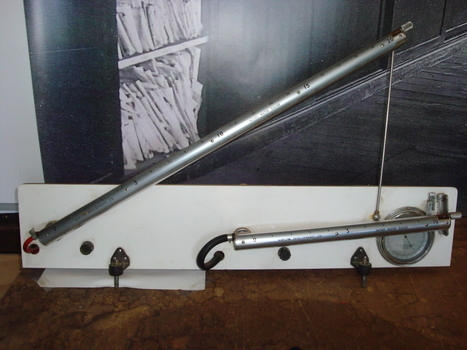 Flat belt pulley stand with multiple pulleys. Set up for driving multiple machines. Present power source is an electric motor. In working order, unpainted. Single stage end suction pump with part of casing cut away to reveal interior. Exterior painted grey, interior blue with edges of cut away in red. Bolted to a metal edged, white painted wooden base. Suction branch 100mm, discharge branch 65mm, impeller diameter 250mm. Two plain, unsealed framed wooden washboards with glass corrugations for scrubbing clothes. 8.1 has a retaining strip across the top of the glass at the back. Painted dark grey early model Thompson centrifugal pump "Class G". Single stage pump. Cream enamel, gas cooker with black painted, cast iron trivets. Gas gun attached. Enameled grill pan with grid. Brand name in black on front of oven door "New world".. Model name "Radiant" in black LLH corner of oven door. Comping stone on wooden trolley used for setting type. "Stone" is made of metal. 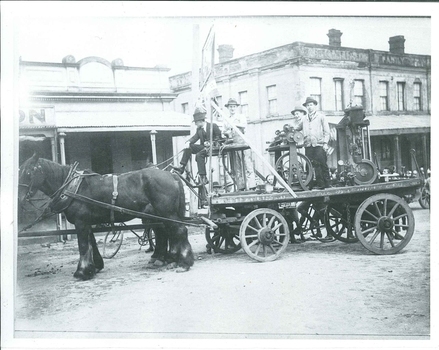 Photograph of four men on dray pulled by two dark coloured horses. There a buildings which appear to be in Castlemaine Near Frederick Street. There are two engines on the back of the dray. (See Registration No. 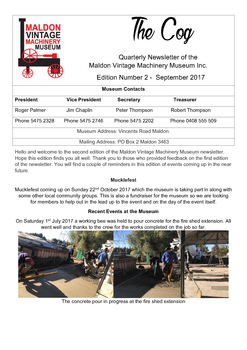 26.3). Green rectangular cardboard box with lid containing 5 feet for various sewing operations, a screw for attaching them, a button hole guide and a hem guide. On lid in red, "Singer / Accessories for 66K Machine No. SIMANCO / 120842", "25527", "12466", "35931", "36583". 31.4 is etched with Singer logo and USA. 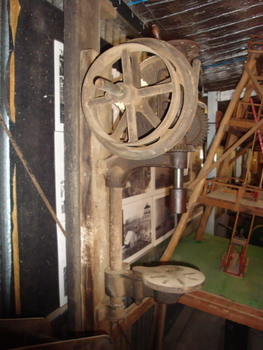 2 stage vertical turbine pump, sectioned for display purposes. Internal parts painted green & red. Battery powered invalid tricycle. Black body-work, wire spoked wheels, 2 small headlights. Appears to be built to accommodate a reclining figure. Contains 2 crimson corduroy cushions, one solid seat cushion filled with Dunlopillo, the other a rectangular back-rest cushion filled with latex foam rubber. Original seat cushion had sage green top with blue/white striped mattress ticking sides & back. Original back support cushion had a cloth label - see below. On an aluminium plate on top of the electric motor :- "Chassis No. 2067, Type EC2, 24-36 volts / RPM 2700 Serial No. 2161". On back cushion: "TEX Foam / Yours for restful sleep / Contents / New Latex Foam / Made by TEXFOAM PTY LTD. Mordialloc. Victoria"
Single stage end suction centrifugal pump set up for flat belt drive. Painted grey. Bilabong. DB85 etched into end of housing. CH12 in relief on end of circular section of housing. Comprises two calibrated cylinders mounted on a board for measuring inches of water. Gauges measure air velocity. Cylinders are of steel with calibrations on aluminium casings. Flexible tubes are connected to reservoirs at the back of the mounting board, one black rubber the other red plastic. A reference barometer is mounted at the bottom right hand corner of the backing board. Reservoirs at the rear are of metal, coloured blue. 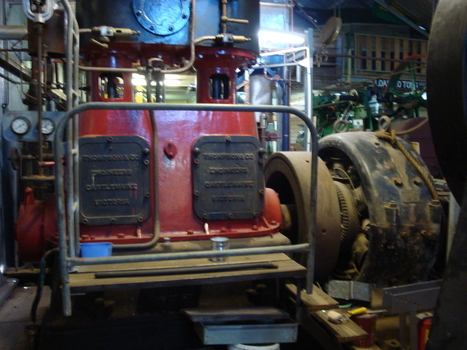 Siemens DC generator driven by a Thompsons two cylinder steam engine. 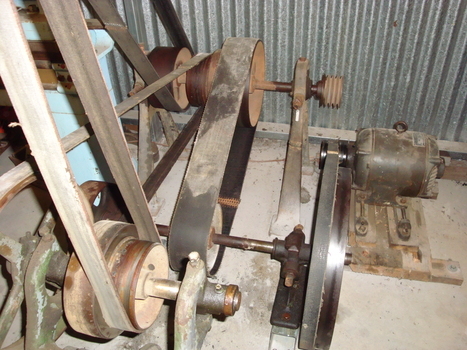 The engine has vertical cylinders and there is a flywheel between the generator and engine. Generator painted grey, engine painted red. The system is connected to low pressure steam and can be run very slowly. Brass plate on generator "Siemens Brothers / Dynamo Works Ltd. / London Stafford / Direct Current Generator", followed by specifications. Thompsons Engineering in relief on steam engine side plates. "60" on base of engine. Articulated arm type manual drawing machine with grey crachle finish. Very dark brown handle, chromed fittings. W&G scale rulers. "Ray & Gilbert Pty Ltd / Serial No. 21XT"
Wall mounted drill press, flat belt pulley driven. Flat belt pulley and flywheel on LHS, hand operated drill lowering mechanism on RHS. Unpainted. Cast in relief on main frame "No 1082" on LHS, "Buffalo Forge Co. / Buffalo N.Y." on RHS.